Bottesford village band at the Coronation Celebration of George V in 1911: Albert Allen, proprietor of the Tea Rooms and possibly John Allen's father, is the man smoking a pipe at the centre of the image. Bottesford Heritage Archive BOT/002/006, contributed by the late Mrs Dorothy Beedham. John Allen is found in the list of Absentee Voters from Bottesford, 1918/19, where his home address was given as Barkestone Lane, Bottesford, and his service identity as 486785 Sapper 229th Field Coy Royal Engineers. He was also in the 1919 Register of Electors in Bottesford, again as an Absentee Voter whose home address was on Barkestone Lane, along with Florence Edith Allen, probably his wife (or sister). The investigation of John Allen’s life has been made difficult by the fact that his name was widespread in the forces and wider afield. There are no Allens in the Bottesford census of 1901. However, in the 1911 census, there was an Allen family living in the third house visited on Grantham Road. Here lived Albert Allen, a 47 year old joiner from Long Clawson, and his 43 year old wife Kate Allen, from Bottesford. The census records that they had been married 24 years (married in 1887, possibly in Bottesford) and had two children at home in 1911, Ethel Kathleen, 20, a post-card seller, and Evelyn Helen, 14, an apprentice dressmaker, both born in Grantham. It is possible that John Allen was another of their children, born in Grantham, but if so he has not been located in the census. The parish records from Long Clawson confirm that Albert Allen was christened in 1864, but do not record his marriage or the birth of a son called John (or of any other children). He had probably moved away before he married and set up home. The parish records for Bottesford record the christening of Ethel Kathleen in 1891 to Albert and Kate, and also that of a son Thomas George in 1894, but neither Evelyn nor a child called John are recorded. Records from the General Register confirm the birth of Thomas George in 1894, but also record his death in the following year, 1895. In 1891, Albert Allen lived at Wharf Road, Grantham, a 26 year old joiner from Long Clawson, with his wife Kate, a baby daughter Ethel K (<1 yr) and two visiting Challands girls from Bottesford, Mary E,, aged 18, and Emily, aged 12. By 1901, Albert and Kate were at Stanton Street, Grantham, with their two daughters Nowhere in all this is there any sign of a son called John. It is clear from entries in Kelly’s Directory for 1912 and 1916 that this family ran Allen’s Tea Room for several years. Though the location of the tea room is on what is now called Easthorpe Lane, it may have been regarded as part of Grantham Road before the post-WW1 re-routing of Grantham Road along its present alignment. Albert and Kate Allen are also found in the 1939 Register, still living on Grantham Road. By this time, Albert described himself as a retired carpenter born on the 10th April, 1864, and Kate gave her birth date as the 6th December, 1868. 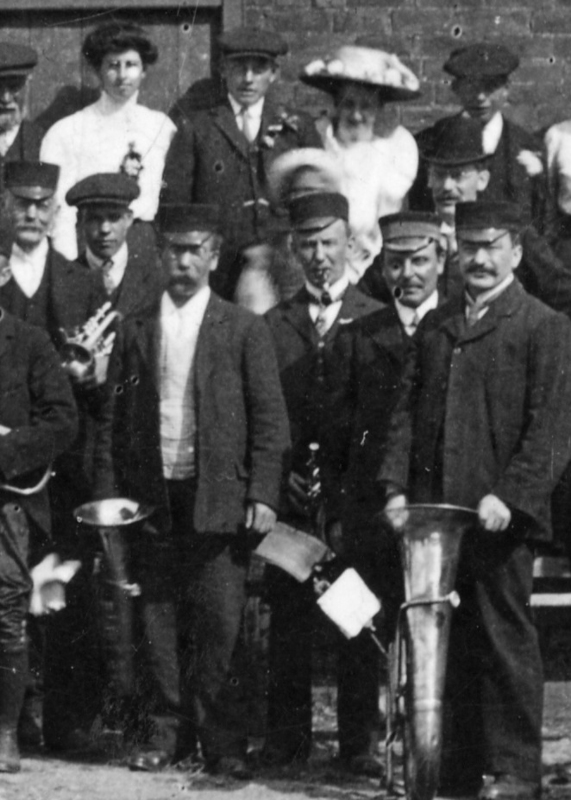 The Bottesford Heritage Archive picture from 1911 of the village band and crowd celebrating the coronation of George Vth (Courtesy of the late Mrs Dorothy Beedham) includes a bandsman identified as ‘Mr Allen Tea Gardens’. Presumably, this dignified pipe-smoking gentleman trumpeter seen in the band is the 47 year old joiner from Long Clawson. However, none of this links a young man called John Allen to Albert Allen’s family: there may be no link between them. There was a Police Inspector, William Allen, from Leicester, who in 1891 resided at the police station in Queen St, aged 53, and died in 1908, aged 70, and was buried in St Mary’s churchyard. Other records include a Police Constable, John Thomas Allen, aged 27 in 1911 when he was residing at Churchill St, Leicester, place of birth ‘unknown’. Another Police Constable called John Allen was aged 26 in 1911, when he lived at 21 Fairfield St Leicester. There was a canal worker called John William Allen, who was 31 in 1911 and came from Wymeswold. None of these are shown to be associated with Bottesford. Any of these, and also a number of other John Allens, could have moved to Bottesford after 1911, but there are no records to confirm this. Bottesford Heritage Archive has a picture showing a crowd waiting to board a motor coach at the Wheatsheaf pub (the Muston Gap) during the interwar years, among whom is a retired police sergeant called Jack Allen, at left of picture. Could this be the man who fought in the RE? Searches of military records for sappers called John Allen failed to locate one with the right service number. 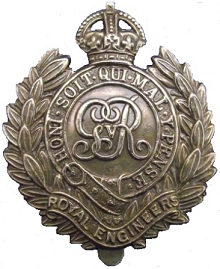 In fact, as things stand, we know that there was a Sapper 486785, 229th Company Royal Engineers, whose home was in Bottesford, but nothing more about him with any certainty.